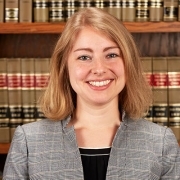 Colleen Davis recently passed the Kentucky Bar Exam and joined the firm as an Associate. Colleen graduated from Washington University in St. Louis, Missouri in 2014, and clerked with PPOA during the summer of 2013. Colleen is a native of Lexington, Kentucky. Her practice will focus primarily on medical and professional liability.